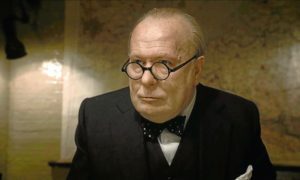 Gary Oldman (Tinker Tailor Soldier Spy) goes for the gold Oscar statue in Darkest Hour, a chronicle of Winston Churchill’s gutsy indoctrination into his newly appointed spot as Prime Minister of England during a crucial time during World War II. Handsomely produced and boasting strong work from some Britain’s best thespians, Darkest Hour is more than Oldman grandstanding beneath globs of makeup: Director Joe Wright (Atonement, Hanna) fashions a solid, classy war drama around him, although it is Oldman that people come to see and will likely be remembered as the film that got him the Academy Award come March 4. 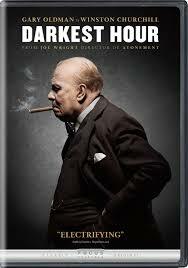 The film begins in May 1940 with the ouster of Neville Chamberlain as Prime Minister, and Churchill replacing him. The Nazis are picking up speed in Europe, and Churchill is called on by his fellow diplomats to sign a peace treaty with them. But the cigar-puffing military strategist goes against their wishes and figures out a way to save British troops stranded in Dunkirk at a crucial time. The film works as an interesting counterpart to the military action presented in Dunkirk, released several months earlier. Darkest Hour offers a look at the machinations that go on behind-the-scenes of the event, and it makes the film a solid cinematic companion to Christopher Nolan’s production. But what Nolan’s film doesn’t have—a charismatic anchor at the center of the action—Darkest Hour has in spades, in the guise of Oldman who delivers a tour-de-force turn as Churchill. Unrecognizable with a balding pate, multiple chins and prominent jowls, Oldman not only captures Churchill’s appearances but his strengths, patriotism, ego and flaws: the film moves from war room to underground bunker to a living room shared by Churchill and wife Clemmie (Kristin Scott-Thomas, Nowhere Boy), to present different facets of a complicated man. An expert supporting cast—including Lily James (Pride + Prejudice + Zombies) as the Prime Minister’s new secretary, Ben Mendelsohn (Rogue One: A Star Wars Story) as King George VI and Stephen Dillane (TV’s Games of Thrones) as Viscount Halifax—all add colorful moments to the proceedings. While Darkest Hour has amassed only about quarter of what Dunkirk made at the box-office, it has a spirited life ahead of itself on the home market where war-related entries typically do quite well.